At any given moment, I have about four different lip products in my bag. Whether it’s a lipstick bullet, a tube of Burt’s Bees Tinted Lip Balm, or the Fenty Beauty Gloss Bomb, there’s something to help my lips look better than normal. What that means is that even with my pile of products, I’m still looking for my holy grail, and I think Innisfree has done it. 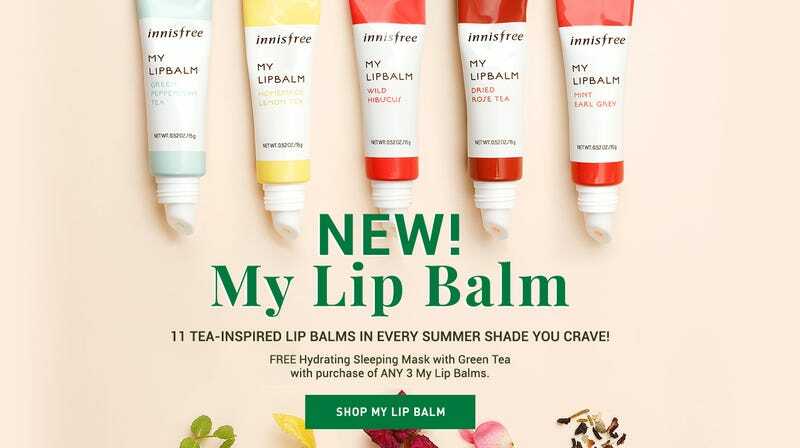 In my inbox last week, I saw that they launched their new tea-inspired lip balms. There happens to be an Innisfree store right by our office, so I went after work, and consequently fell in love. Coming in 11 different shades, the My Lip Balm features a range of options that go from a sheer to intense tint for that “your-lips-but-better” look, but with the taste and smell of tea. I opted for #6, Mint Early Grey, both for the soft peach color it exudes and the taste of my favorite tea on my lips all day. Throughout the day while wearing it, I only had to reapply it once or twice, and while the scent faded, the hydration didn’t. So many times I end up somehow with drier lips than I started with when applying a lip balm, but this one didn’t do that. And with the range of color (and flavor) options, you can buy a couple different shades to throw into your bag instead of piling random lip products you’re unsure you even like anymore. Are Lip Masks the New Face Masks?